Traditional cinnamon buns are made with yeast, but these biscuit-dough buns are faster to make and just as delicious. Add chopped nuts and/or raisins if desired. Preheat oven to 375°F (190°C). In a small bowl stir together 2 tablespoons granulated sugar and cinnamon. In a large bowl sift together flour, remaining tablespoon granulated sugar, baking powder, and salt. Cut butter into small pieces and with your fingertips or with a pastry blender blend into flour mixture until mixture resembles coarse meal. In another small bowl whisk together egg and 3 tablespoons milk and add to flour mixture, stirring until just combined. Transfer mixture to a lightly floured surface and gently knead, 3 or 4 times, until it forms a dough. Pat dough into a 10 x 6-inch rectangle. Brush dough with some remaining milk and sprinkle evenly with cinnamon sugar, chopped walnuts and raisins, if using. Beginning with a short side, roll up rectangle to form a 6-inch log and cut crosswise into 4 pieces. Arrange pieces on a baking sheet, cut sides up, with seams touching. Bake buns in middle of oven until pale golden and cooked through, about 18 minutes. Makes 4 buns, 2 servings. I baked the buns last night for my aunty and her family. They loved them. Today she called me for the recipe. 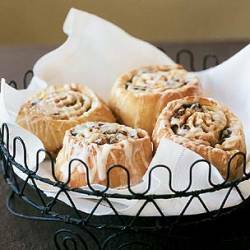 excellent recipe, they taste better than cinnabon. I tried this recipe and it was really good. they taste just like the ones i've bought from the bakery. They are fantastic. My family and I loved them. Thanks Diana. Disappointed with the buns. I think traditional bun recipes are much better. Fantastic! We had a slumber party with the girls and they loved em! Thanks Diana, you're our hero! They're really fast to make & my kids really love them! tastes great! I made it for my cousin from Ireland & she loved it! Very good! I used a cream cheese frosting that worked very well with the rolls. looks soo yummy. i just want to make all of your recipes, they all look so delicious! !